Let’s get the ball rolling with a few biggies and one that may seem small but is a common source of issues. A strobe in underwater photography terminology is an external flash. This comes from the use of the term strobe in land based photography as the name for a large mains powered studio flash. Not to be confused with a diving safety strobe that emits a bright repetitive flash to attract attention. The Z330 is the top of the range strobe produced by INON. The moveable peaked hood is designed to reduce backscatter in shots. This is one of the more confusing aspects of strobes . TTL stands for Through The Lens and relates to how cameras control how much light their flash puts out. In reality this is how long each flash of light lasts, the brightness of the flash doesn’t actually change. In very simple terms the camera works out how long the flash should stay on for based on how it thinks the exposure of the shot should be. Cameras do this in a couple of ways. Either firing a preflash and measuring what is reflected back from the subject before firing the flash for the actual shot. By exposure metering to work out how much light needs to be added to the shot. Or by a combination of both. In all cases the camera uses the information it measures to decide how long the flash fires for. A strobe set to TTL matches it’s output to how long the camera triggers its flash for, or in the case of cameras that only have hot shoes how long the camera would trigger an external flash if it had one attached. 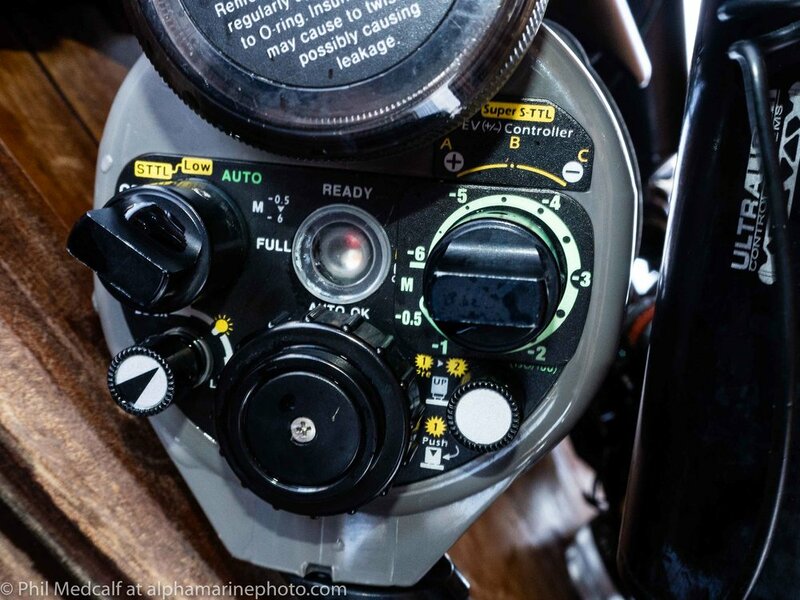 Some strobes only have fibreoptic connections and so will only allow you to use their TTL mode (usually called S-TTL or DS-TTL) with built in flash or a specific trigger designed for fibre-optic TTL triggering. In the case of electronic triggering from a camera’s hotshoe a TTL convertor such as those built into Ikelite DSLr housings are required. When using two strobes in a confined space you may struggle to get both in a position to light your subject easily. In this case the right side of the blenny is in shadow because the fire coral blocked my righthand strobe. This may be a bit controversial, especially as there are some very popular TTL only strobes on the market, but I would always recommend using your strobes on manual control. TTL relies on your camera and strobe electronics to decide how you want your image to be lit and often you’ll find this won’t match what you actually have in mind. This is why almost all the big names in underwater photography shoot with their strobes on manual. From my own experience I’ve not used TTL since my first dives with a strobe. Despite what plaudits of TTL say about it being more consistent, I found it actually less so, with many shots not being lit as I would like them. There are ways of adjusting your strobe’s power when set to TTL either by using your camera’s Flash Compensation or by a control dial on the strobe in some cases. But as soon as you start doing that it raises the question why not just use your strobe on manual and have full control over your lighting? Many strobes like this INON Z240 allow the user to adjust the output when in TTL mode to some degree. But why not use it on manual as you are only going to be using the same dial anyway but in manual you’ll have greater control. Some strobe and camera combinations don’t allow TTL at all or only in certain camera modes often not full manual. This is the case for several of the recent Canon compacts and for me reason alone not to invest in a TTL only strobe as Canon make some of the best compact cameras for underwater photography at the moment. Using TTL also means you’ll use more battery life in a lot of cases. Many cameras will let you set the flash output manually to a low level. This is enough to trigger a strobe set to manual but with a strobe set to TTL you need the cameras flash to be on Auto for the exposure to be matched. In some cases you can adjust the strobe output while on TTL by setting your camera flash to manual and altering it’s power but then you are back to the question ‘why not just alter the strobe output directly’. You don’t have to buy two strobes. One will do a great deal. Here Anne is a using a single INON S2000 placed above the lens port to give even lighting. What is the magnet for on the INON S2000? This is regular issue, especially for people buying used S2000’s. The magnet is one of the most commonly lost INON parts often because the owners don’t realise what it is for. In fact the magnet is instead of a switch to set the strobe to work with a camera that doesn’t have a preflash. Camera brands such as Olympus and Canon allow you to use their flash in a manual mode which doesn’t fire a preflash. If you are using manual flash on your camera with an S2000 you need to have the magnet inserted. If you are using flash in an Auto mode and with the Sony cameras that have built-in flash you don’t have any choice, then you need to not have the magnet inserted. The screw circled in red is where the magnet is fitted to set the INON S2000 to work without preflash. A similar thing applies with other strobes which have switches or buttons to set for whether you are using pre-flash or not. Having your strobe set incorrectly either for preflash when your camera isn’t using one or to no preflash when camera does use one is a common reason for your strobes not lighting your pictures. With fast recycling strobes you may intermittently light your shots with the strobe set to no preflash and the camera flash firing it, because your strobe will fire with preflash and the main flash. But this will be hard on your batteries and reduce the life of your strobe as lots of repetitive firing will damage it. Controls on the back of a Sea & Sea YS-01. The two lightning bolts on the left hand dial is for when using with preflash on your camera and the single solid lightning bolt is without preflash. When using your camera’s flash set to manual (if it lets you) it won’t fire a preflash. I’m going to stop there with this first chapter on strobes. Hopefully I’ve not upset too many fans of TTL and at least enlightened a few of our readers as to some of the issues surrounding strobes.